Posted on 22 February 2012 and filed under Miscellaneous. Last week I was in the Netherlands. I love the Netherlands very much, there are many reasons for it – why and what, another time. I was on the south, in the Province of Limburg, visited friends in Rotterdam, then spent a few days wandering around Amsterdam. There are many places in the city that I need to visit whenever there is a chance. Bloemenmarkt, the flower market, is one of them. For the likes of me, the flower market is a place where a person can spend hours, watching and browsing. For the start, tulips. Ah, tulips. Is there anyone who does not know that they are my favourite flowers and that my attachment to them borders with obsession? Apart from tulips… whatever you can think of that you would like to sow, plant or place in a vase – you are going to find it there. Yes, the market is quite a tourist place too, and a part of the merchandise – and prices, I would dare to say, are adjusted to that. Being a tourist myself, I better keep quiet. And about prices… At this flower market, you can buy 50 tulips for 10 to 7,50 EUR, depending on a shop’s position. Some 40 minutes walk further, at Albert Cuyp Market, you can buy them for 5 EUR. This means that price of a single tulip is from 0,10 to 0,20 EUR. The price of a single tulip in Zagreb is a tiny bit more than 1 EUR. Some difference is expected, the Netherlands, tulips, Croatia, transport, import duties, etc. But ten times more expensive? Ten? Ok, this is not supposed to be a rant about my frustration with tulip prices in Zagreb. Which anyway stops when the spring comes and I can satisfy my tulip needs watching some hundreds of them in my garden. This is not a post about fabrics or sewing either, at least not directly. This is a gallery of Amsterdam flower market photos. Hope you enjoy it! 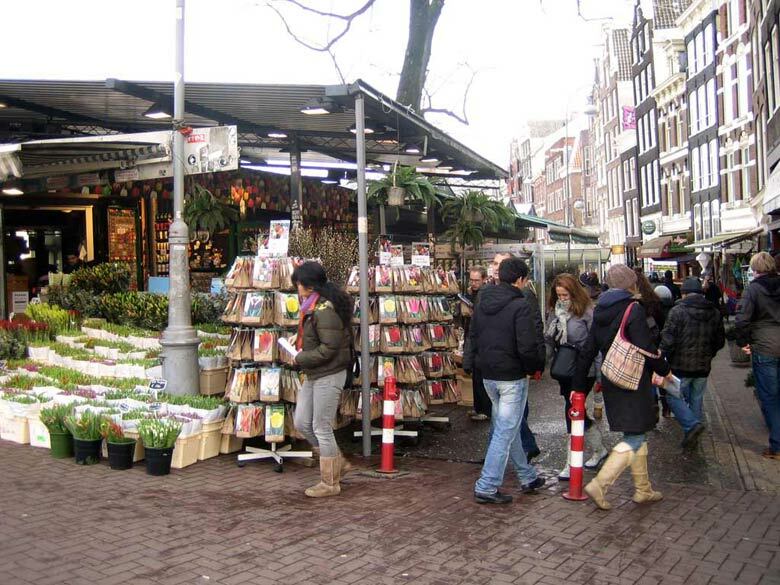 Amsterdam Bloemenmarkt – Amsterdam flower market. The entrance to one of shops. Further inside there are seeds, seedlings and everything related to gardening. Souvenirs too. Amaryllis. Magnificent huge flower. It should be planted in a pot leaving top quarter or third above the soil. When in a week or two the stem starts to grow, it grows more than a centimeter a day. I witnessed it. Creation of the bud and opening of the flower is spectacular! Amaryllis bulbs. These babies are big! And no, this is not in the shop from the previous picture – here it was ok to touch the bulbs. Muscari. They grow in my garden, and I am not sure about their Croatian name – muscari as well? Shame on me. “Blushing is the colour of virtue”, the tulip says. Interesting. The tree of life, as we used to call it when I was a kid. My uncle sailed the seas around the world and he would always bring very interesting things home. One of those were mini-logs such as these. The log is then put in a vase and – it returns to life, grows roots and opulent leaves! It can live like that, in water, or it can, of course, be planted. Klompen. Clogs. What are they doing at the flower market? Well, they can act as flower pots. You might want to nail them to a wall and plant flowers in them. I am developing a taste for pink!